The Lone Walker in "18 Miles Out"
The Lone Walker is a cold, distant figure moving through an empty field. We see it as Shane does: gazing through a car window, sitting next to the man who should be his best friend, following a day filled with regrettable actions. It is far enough away to make distinguishing any features impossible. The Lone Walker is anonymous and unknowable, but it is difficult to not feel sadness rather than fear while gazing upon it. This is a mirror for what Shane has become. He has finally been told, beyond a shadow of a doubt, that Rick’s family is just that: Rick’s. He has relentlessly beat on the man he calls brother. He has attempted to murder two people and subsequently been rescued by them both. When Shane is looking upon the Lone Walker he feels a kinship. He was alone before, but it is painfully obvious now that there are so few people in the world. He has no more purpose than a mindless corpse shuffling through the dying grass. This moment in the car is perhaps the first time we see Shane look utterly defeated. In what is a moment of synergy, the song playing over this crisis of mind is “Civilian” by Wye Oak. In a different man, this may have been the turning point back to humanity. However, like the Lone Walker, Shane will not remain an object of pity for long. He has become a creature driven by survival and possession. The enormity and emotions of the day in “18 Miles Out” tapped him out, but his slide into something less than human began long before and shows no sign of stopping. Once he has a chance to regroup, Rick’s unequivocal claiming of Lori, Carl and the baby will be taken as a gauntlet thrown and Shane’s efforts to wrestle control of the group will be renewed with a sense of vigor. The Lone Walker is not merely a lonely traveller. 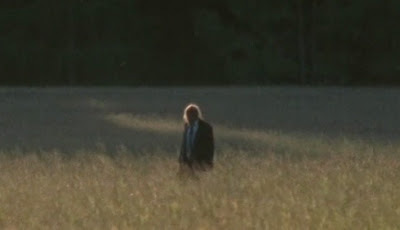 The Lone Walker is the harbinger of the threat of Walkers to come and the danger of Shane’s continuing deterioration. It is the calm before the storm and the sky is starting to look awfully cloudy.